~ What is Wheatgrass? Wheatgrass is a plant that is grown from the Red Wheat Berry, a special strain of wheat that produces high concentrations of chlorophyll, active enzymes, vitamins and other nutrients. ~ How Is Wheatgrass Grown? 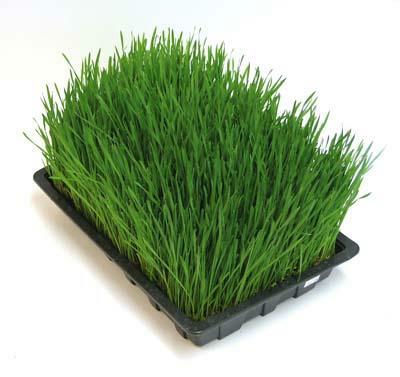 We grow Wheatgrass in a controlled organically rich soil environment until it reaches maturity. ~ What is Chlorophyll? Chlorophyll which makes up over 70% of the solid content of wheatgrass juice is the basis of all plant life. Chlorophyll is often referred to as "the blood of plant life." and It closely resembles the molecules of human red blood cells. ~ How is Chlorophyll so closely related to human blood? Both Chlorophyll and Hemoglobin share a similar atom structure to create the there respective molecules, as shown below. The only actual difference in the two molecules is that of the metallic atom element. In human blood or hemoglobin consists of iron, while in Chlorophyll the metallic atom is magnesium. ~ What is the importance of Chlorophyll's resemblance to human blood? Since Chlorophyll and Hemoglobin are so much alike in atom structure it allows it to be absorbed quickly and begin to rebuild the blood stream. ~ What are enzymes? Enzymes in laymen terms are like highly skilled workers on an assembly line. Each enzyme performs a specific function within the body while in harmony with other enzymes. They are important and required for everything we do, vision, thought, dreams, reproduction, breathing, digestion are all controlled by enzymes. ~ Why are enzymes so important for good health? With the important role of enzymes involvement in every body function, it is necessary that we intake adequate enzymes on a daily basis. Unfortunately, medical doctors have found that we don't get all the enzymes we need from our cooked, over salted and over processed foods. This intern results in overall poor health situation. Wheatgrass Juice can provide the additional enzyme intake your body requires for overall good health. ~ Is it true that enzymes aid in the prevention and curing of cancer? Yes, it is true that enzymes have been linked to the prevention and curing of cancer. In an article recently published in the Journal Of Longevity Research Vol.2/No.4 1996, enzymes were praised for there ability to combat the cancer disease. Enzyme in short deter the cancer cells ability to hide from the immune system and spread throughout the body. ~ What is Wheatgrass Juice? Wheatgrass juice is the pure juice that is extracted from the wheatgrass pulp that human bodies can not digest. The juice consist of 70% chlorophyll and active Enzymes, vitamins and nutrients. ~ How much Wheatgrass Juice should I drink? We suggest that you start out with about 1oz. per day for the first week. Then if you wish you can gradually increase your intake.